This article is step-by-step tutorial how to fix a problem which occured after I restored my virtual machines from backup to my ESXI server. So network adapter is correctly available in my virtual machine. As next step I need to found out which alias is used for this adapter. I didn’t find any easily way than try et0,eth1,…. As last step restart your machine and everything should work correctly. You’re a lifesaver! Thanks so much, this fixed an issue I just couldn’t figure out. I’m getting same problem, been seargin the interweb all day with no luck…. It is really very helping to me and my friends.. We are very thankful to you..
a really great works! I was quite desperate!!! I had this problem and did not know how to solve it ..
You can edit that file and remove the old rules but unless you have some complicated networking requirements, just remove the file and reboot and you will find your network connection on eth0 as you originally expected. Helped me get the VirtualBox bridged adapter to work with Debian 6. Thanks for this post. I used this on Debian. Thank You very much. 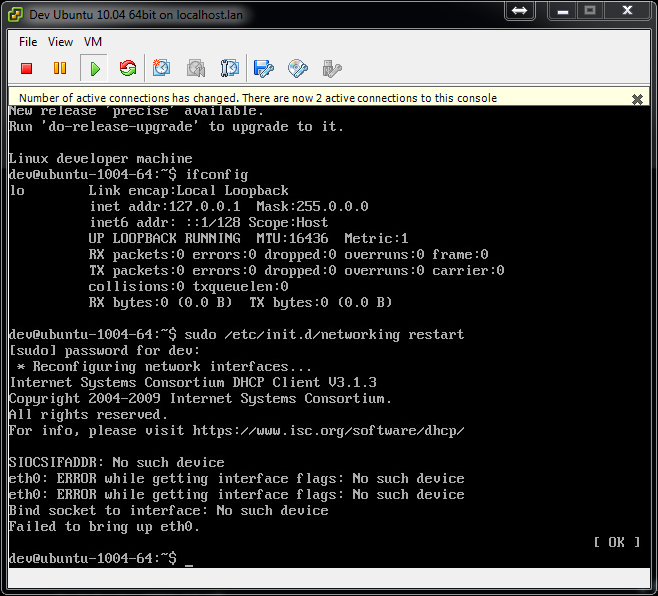 Solved my problem with Freepbx on CENTOS. We saved lot of hours of web searching. This information save my life. This was just the thing i needed.